Dietitians can encourage clients to eat more whole grains by dispelling myths about this nutritious food group and teaching how to prepare them. Whole grains for whole health: If whole grains were to run an ad campaign, that might be their slogan—and for good reason. Defined as grains that contain the bran, endosperm, and germ intact, such as brown rice or barley, whole grains have been a central component of the world's most healthful diets for centuries. And their many benefits largely have been backed by numerous research studies to date. "Regular whole grain consumption is associated with a reduced risk of stroke (30% to 36%), type 2 diabetes (21% to 30%), heart disease (25% to 28%), inflammatory disease, gum disease, and colorectal cancer, as well as better weight maintenance and healthier carotid arteries," says Kelly Toups, MLA, RD, LDN, program manager at Oldways' Whole Grains Council, who refers readers to the council's backgrounder on whole grains' health benefits on its website. "In fact, just one 1-oz serving of whole grains per day is associated with a 5% lower risk of death and a 9% lower risk of death from heart disease." As a testament of whole grains' goodness, Toups refers to a recent report from the 2015 Dietary Guidelines Advisory Committee stating that if consumers were to make just one-half of their grains whole, "whole grains would provide substantial percentages of several key nutrients, such as about 32% of dietary fiber, 42% of iron, 35% of folate, 29% of magnesium, and 16% of vitamin A." "While that's certainly impressive, double those numbers and imagine what would happen if we made all of our grains whole," Toups says. While Janet Bond Brill, PhD, RDN, FAND, a cardiovascular nutritionist and author of Cholesterol Down and Prevent a Second Heart Attack, says whole grains are superstars when it comes to promoting health, most Americans have yet to jump on the bandwagon. "Unfortunately, the average American eats less than one serving of whole grains per day, and almost one-half of all Americans never eat whole grains at all," she says. While social media sites such as Pinterest and a wide array of foodie blogs have helped make whole grain recipes more accessible to the general public, Brill says Americans still have a long way to go to increase whole grain consumption to recommended levels. "I suspect this lack of whole grain intake is due to the ubiquitous amount of refined grains in the food supply as well as the lack of whole grain access in the food deserts," Brill says. Time and unfamiliarity are two other reasons for the lack of whole grain consumption. "Some people may be under the false assumption that whole grains take longer to cook or are more expensive, without realizing the wide variety of quick cooking and inexpensive whole grains that are available," Toups says. Nevertheless, the barrier to cooking and eating whole grains isn't as high as many people think. Pass along these cooking tips for how to get the most flavor and best product from the following whole grain varieties, and encourage clients to choose more whole grains for better health. Native to the Aztecs, and traditionally used in the cuisines of Mexico, Peru, and many other Central American countries, amaranth, Toups explains, isn't technically a cereal grain but is considered a "pseudocereal" because its cooking uses and nutrition profile are so similar to other grains. Naturally gluten-free, amaranth houses plenty of nutritional goodness, with three times the average amount of calcium than other grains. "It's also high in iron, magnesium, and phosphorus, and it's the only grain documented to contain vitamin C," Toups says. Moreover, amaranth is one of the grains with the most protein, coming in at almost 5 g per 1/2 cup cooked, and it's often considered a complete protein because it contains lysine, an amino acid missing or only present in small amounts in most other grains. "Amaranth is easy to prepare," Toups says, though she cautions beginners that it tends to release starches while cooking, which can drastically thicken the cooking liquid. For this reason, she recommends six cups of liquid per one cup of amaranth; bring it to a boil, simmering for 15 to 20 minutes, then drain and rinse. Give clients a heads-up that the final cooked product may not resemble what you're used to when cooking more processed grains. "It never loses its crunch completely but rather softens on the inside, leaving a slight crunch on the outside," says Diane Henderiks, RDN, a New Jersey-based dietitian and professional chef who focuses on healthy lifestyle and wellness tips. Angela Rivera, a natural food chef who has taught children and families how to eat in practical ways in numerous cooking classes, says the biggest challenge in cooking amaranth is its tendency to get too thick and even slimy if it sits too long. "To prevent this, immediately after cooking this grain, strain and rinse it in a fine mesh strainer," she says. "This will give you the best flavor and texture." Although amaranth isn't particularly well suited for a pilaf, Toups says that after drying the grains a bit on a flat, dry surface, they make a great addition sprinkled on salads, added to cookie batters, or stirred into soups. "The grain can also be popped, like popcorn," she says. Because amaranth cooks a bit differently than other whole grains, clients should know they can't always substitute it cup-for-cup for other grains in recipes. "However, once you familiarize yourself with amaranth, it's easy to incorporate this quick-cooking grain into your repertoire," Toups says, noting that it works great as a thickener, so it works beautifully as a base for porridge, stews, or even risotto-inspired dishes. One of the most common grains in the world, brown rice, Toups says, provides about one-half the calories for up to one-half of the world's population, especially in parts of Asia. Because only the inedible hull is removed (vs the bran and germ that are removed with white rice), brown rice retains more nutrients than its more-processed counterpart. "Just one cup of cooked brown rice provides 88% of your daily need for manganese, a mineral that helps us digest fats and get the most from the proteins and carbohydrates we eat," Toups says, noting that brown rice also is a good source of selenium. While brown rice is one of the most versatile whole grains available, as it can be substituted for any recipe that calls for white rice (including savory dishes such as stir fries or sweet rice puddings), Toups says time constraints continue to plague many people who would otherwise love to cook with it. Brown rice can take up to 60 minutes to cook, but Toups says there are ways around that obstacle. "Quick-cooking varieties of brown rice are partially (or completely) precooked, so all you have to do is warm them up for 10 minutes or even as few as 90 seconds in the microwave," she says. "In some markets, cooked brown rice is also available in the freezer aisle, ready to heat and eat." When cooking brown rice, Henderiks suggests using 1/4 to 1/2 cup more water per cup of rice than you would for white rice. And for the best end result, leave your spoon alone. "Never stir your rice," she says, since stirring activates starch and will make your rice gloppy. Rivera insists that the real secret to getting soft and fluffy brown rice (one of the biggest complaints she hears from people cooking with it) is in the steam. "Once you have turned off your flame, just allow the rice to sit in your pot for an additional 15 minutes to continue steaming, and you will have rice so fluffy you won't be able to tell it's brown rice," she says. One of Rivera's favorite (and practical) ways to use brown rice is in one-pot dishes. "I always have cooked brown rice frozen and on hand," she says. "I heat it up in the microwave and toss it in a hot pan filled with diced veggies, coconut oil, black beans, and a sprinkle of cumin, salt, pepper, and turmeric. It's a great last-minute meal." A whole grain that dates back to ancient times, barley is most commonly sold today as either hulled or hull-less barley (without the inedible hull). Pearled barley, though more common in supermarkets, isn't technically a whole grain, because its bran has been removed, Toups says. But according to Jennifer Stack, MS, RDN, CDE, an associate professor of culinary nutrition at The Culinary Institute of America, pearled barley might be easier to get clients to try—and it still has great nutritional benefits. "I like to recommend pearl barley since it's readily available at all grocery stores and is inexpensive and familiar to many people," she says. "Although the bran has been partially removed and the grain polished to some degree, it's still very high in fiber since the fiber in barley is in the whole grain, not just the outer bran layer." Whereas a 1/2 cup of cooked medium-grain brown rice has almost 2 g of fiber, the same amount of hulled barley offers roughly 15 g fiber and 11.5 g protein. Stack likes a brand of hull-less barley from Bob's Red Mill, which she says is grown from an ancient variety of the grain that has a naturally loose hull so it doesn't have to go through the 'pearling' process. "This keeps the 'hull-less' barley a complete whole grain," she says. Barley's fiber is definitely one of its biggest selling points, especially since much of it is soluble beta-glucan fiber, which is known for its cholesterol-lowering properties. "In fact, since 2005, the FDA has allowed barley foods to claim that they reduce the risk of coronary heart disease," Toups says. With its high fiber content, coupled with its chewy texture and nutty flavor, barley, Brill and Stack agree, is a great gateway grain for clients who are new to whole grains. It does take longer to cook (50 to 60 minutes is common), which is why Toups recommends maximizing efficiency by making a big batch and then freezing in ½- to 1-cup servings for later use. Stack's biggest tip concerning barley is, when in doubt, use more rather than less water when cooking. "This helps prevent scorching and burning during the longer cooking times that most whole grains require," she says. Cooked barley can be added to soups and stews at the last minute before serving. Stack recommends simmering barley in a little milk for a great high-fiber hot breakfast cereal. "It's really delicious with almond milk, blueberries, and toasted almonds," she says. Another pseudograin, quinoa (pronounced KEEN-wah) has been trending for years—and for good reason, Toups says. "This tiny pseudograin is native to the Incas, and is commonly imported from Bolivia, as it grows at high altitudes in the Andes," she says. Though botanically, this "chenopod" is more closely related to beets, chard, and spinach, it's used more like a grain in cooking (with a similar nutrition profile). One of the few plant foods that's a complete protein, quinoa contains all nine essential amino acids. A 1/2-cup cooked serving contains 4 g of protein. But while it has a rich nutritional profile, quinoa can pose some challenges during cooking, especially for less-experienced cooks. For the best result, rinse well before cooking; this can make its natural coating, called saponin, taste less bitter. "While most quinoa sold today has had this bitter coating removed, an extra rinse is a good idea to remove any residue," Toups says. First, know that 1 cup of quinoa will cook in about 20 minutes. Secondly, since some people find that quinoa makes their dishes watery, because it tends to hold a lot of water, draining well is a must. And third, "Return the quinoa to the pan after you drain it, then cover and let sit for 15 minutes," Holley says. "Letting the quinoa rest in the hot saucepan after boiling/cooking dries it out, so you don't end up with clumpy/wet quinoa." You'll know when the quinoa is done when you see its little "white tail," which is the germ of the kernel, sticking out. For extra flavor, cook with some smashed garlic or a sprig of rosemary, Holley suggests. "Like couscous, quinoa benefits from a quick fluff with a fork just before serving," says Toups, who notes that quinoa's nutty taste makes it a great addition to grain bowls and salads. Instead of using noodles in your favorite recipes, Rivera recommends substituting quinoa. "I throw quinoa in meatloaf and veggie burgers," she says. "No one ever knows, and they're getting the great benefits that quinoa has to offer. It's also a great substitute for breadcrumbs." Spelt and Kamut (originally known as khorasan wheat), both heirloom varieties of wheat, were crops integral to life in ancient and medieval times. They've been mostly passed over in favor of wheats more compatible with industrialization, Toups says, although Henderiks notes they're still commonly grown in Europe. Though both can be used in most recipes that call for wheat, Toups says spelt and Kamut are more nutritious than refined wheat. "Whole wheat (including spelt and Kamut) is much more nutritious than refined wheat, containing more fiber, more protein, and many essential vitamins and minerals," she says. "In addition, some ancient wheats such as emmer (farro) and einkorn may be much higher in antioxidants and may be digested differently than common wheat." In a Turkish study published in the August 27, 2008, issue of the Journal of Agricultural and Food Chemistry, researchers compared 18 ancient wheats (12 emmer and six einkorn) with two modern bread wheats to assess their total phenolics and flavonoids, phenolic acids, lutein, total yellow pigment, and total radical scavenging capacities. Results showed "remarkably higher total antioxidant activity" in emmer varieties and "quite high levels of lutein" in einkorn samples. A study published in the October 2003 issue of European Journal of Clinical Nutrition compared einkorn bread made with honey-salt leavening, naturally leavened einkorn bread made with crushed whole grains, and commercial yeast bread made with modern wheat. The naturally leavened einkorn loaves significantly reduced the gastrointestinal response of glucose-dependent insulinotrophic polypeptide, a hormone important in controlling insulin secretion. Toups says home cooks shouldn't expect the same result when substituting spelt or Kamut flour for refined wheat flour, since whole grains have a richer taste and denser texture. They also absorb more water. "In addition, wheat berries (including spelt and Kamut) take a bit longer to cook than other whole grains (like millet or quinoa) and benefit from an overnight soak before cooking," Toups says. This makes them easier to cook and also easier to digest. As a rule of thumb, Toups recommends substituting whole wheat flour for up to one-half of the all-purpose flour in an existing recipe. "To make foods using more whole wheat, we recommend you start with recipes specifically designed to be their most delicious with whole wheat," she says. Wheat berries also make great side dishes or work well in casseroles, she adds, just be sure to soak them overnight. If you like very soft spelt berries, Henderiks recommends adding three cups of water or stock to 1 cup of spelt, then covering and simmering for 11/2 hours. "If you like them chewier and nuttier, use two cups of water or stock for every one cup of spelt berries," she says. "Cook the spelt like risotto, adding one-half cup at a time and stirring after each addition until the liquid evaporates. They should be tender after about 30 to 40 minutes." Henderiks particularly likes substituting spelt for rice or pasta in a salad with curry or greens. Besides telling clients about all the great nutritional benefits whole grains offer, what's the best way to encourage them to choose more of the whole variety for themselves? According to Toups, it starts with having a conversation about the reality of carbs—and that the right carbs are nothing to fear at all. "Pop-science books and celebrity fad diets have caused a lot of nutrition confusion surrounding grains and health, so first and foremost, RDs should help consumers understand the benefits of whole grains," Toups says. "As dietitians, it's our job to make sure that consumers understand that whole grains are a necessary part of a healthful diet, and have been at the core of traditional diets for millennia." Kimberly Gomer, MS, RD, LDN, director of nutrition at Pritikin Longevity Center + Spa in Miami, agrees. "One of the biggest obstacles with clients is to get them to stop fearing carbohydrates," she says. "We're so protein pushed that generally grains are feared instead of embraced. The goal for RDs is to explain that grains have many health benefits, and that clients can embrace them." RDs can help clients learn how to identify whole grains by looking for the word "whole" on the ingredients list and the Whole Grain Stamp on product packaging. There are two versions of the Whole Grain Stamp, both of which feature a stylized sheaf of grain on a golden-yellow background, making it easy for shoppers to spot. Any product that bears the 100% stamp contains grain ingredients that are all whole (with a minimum requirement of 16 g of whole grains per serving). The basic stamp, which is similar in style but doesn't boast the "100%" claim, means the product has at least 8 g of whole grains but also could contain refined grains in its ingredients. All stamps are individualized in that they specify how many grams of whole grains a product serving offers, with a simple but important reminder at the bottom to shoot for at least 48 g of whole grains per day. And whether advocating the more "exotic" choices such as spelt or amaranth, or old-fashioned goodies such as oats and brown rice, make sure clients know all whole choices are great. And the more, the merrier. "Just as clients are encouraged to eat a variety of fruits and vegetables, remind them that the same rule applies to grains," Toups says. "If you're only eating one or two whole grains, it's time to add more variety to your diet." When it comes to learning new cooking techniques, sometimes showing helps reinforce the concept better than telling. 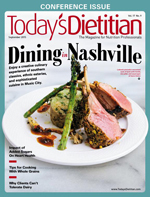 "Show them (if you can)," says Monique Richard, MS, RDN, LDN, integrative clinical dietitian and owner of Nutrition-In-Sight. "If you have a setting to demonstrate how easy and tasty something can be, clients are more likely to apply that to their own lives," she says. Don't just show how easy cooking whole grains can be—also discuss cost, preparation tricks, variations, and health benefits. However you choose to share the goodness of whole grains, whether it's through cooking demos, hand-outs, or by sharing your favorite whole grain recipes or products as Toups recommends, you're helping clients make the connection between good taste and good health. — Juliann Schaeffer is a freelance writer and editor based in Alburtis, Pennsylvania, and a frequent contributor to Today's Dietitian. • Wu H, Flint AJ, Qi Q, et al. Association between dietary whole grain intake and risk of mortality: two large prospective studies in US men and women. JAMA Intern Med. 2015;175(3):373-384. 2. Bring the broth and water to a boil. Add the barley, cover, and reduce heat to a simmer. Cook the barley until soft but not mushy, about 55 minutes. Set aside and keep warm. 3. Heat the olive oil in a sauté pan over medium-high heat. Add the sausage and brown. When the sausage is partially cooked, add the onion, garlic, Italian seasoning, and black pepper. Cook until the onion is soft and sausage is fully cooked, about 2 minutes. Remove from skillet and set aside and keep warm. 4. Add the mushrooms to the pan and sweat until they release most of their liquid. Add the spinach to the pan and cook just until wilted but still bright green. Add the mushroom mixture to the sausage mixture. Add the marinara sauce, barley, and one-half of the cheese. 5. Stuff each pepper half with 1 cup of the filling. Cover the stuffing of each pepper with a square of foil coated in cooking spray. Place the pepper foil side down in a baking pan. Bake until the juices are bubbling, about 30 minutes. 6. Turn peppers over and remove foil. Sprinkle remaining cheese on top and serve. Enjoy this sophisticated variation of rice pudding as a dessert or as a sweet treat at breakfast. The recipe can be made from leftover barley, too. 1. For the barley pudding: Combine all of the ingredients except the raspberries in a heavy saucepan. Bring to a simmer and cook for 8 to 10 minutes, stirring frequently. 2. Remove from the heat and fold in the frozen berries. Allow to cool. 3. Meanwhile, combine the ingredients for the lemon ginger cream and simmer for 5 minutes. Allow to cool and remove the ginger slices. 4. Using a 1/2-cup scoop, portion the barley pudding into individual ramekins. Top with 1 T lemon ginger cream per portion and serve. In this Mediterranean-inspired quinoa recipe, dried fruit and cinnamon contribute all of the sweet taste—no added sugars needed. Dried figs are deliciously sugary, and when joined with Turkish apricots, raw walnuts, and cinnamon, this breakfast cereal is given a decidedly Mediterranean flair. 1. Bring water and quinoa to a boil. Then, reduce heat to low and simmer covered for about 15 minutes, until the outside coat of the grain separates into a curly tail, and all of the liquid is absorbed. 2. While the quinoa is simmering, chop the figs, apricots, and walnuts into small, bite-sized pieces. Add the chopped fruit, nuts, and cinnamon to a large bowl. 3. When the quinoa is done cooking, add to the bowl and toss with the fruit and nut mixture until combined. 4. To serve, divide the quinoa mixture among four mason jars, and add 1/2 cup milk to each jar. Cover and refrigerate overnight. (This allows the fruit to soften a bit, and also allows the flavors to mingle more freely.) Alternatively, you also can keep the quinoa mixture in a covered container in the fridge. Then, when you're ready to eat, simply scoop about 1 cup quinoa mixture into a bowl, top with 1/2 cup milk, and eat like regular cold cereal.